Subject: Antique Master Print, untitled. 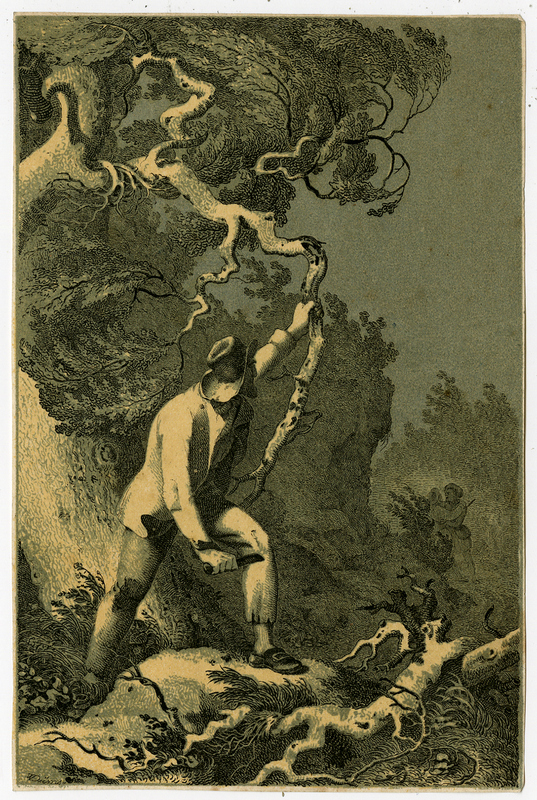 A vagabond with a knife cutting the roots of a tree. He watches two grappling figures in the background. Condition: Good, given age. Margins cropped close to the image edge. General age-related toning and/or occasional minor defects from handling. Please study scan carefully. Medium: Very fine woodblock print, printed in colour from multiple blocks in black and blue on wove paper. Size (in cm): The overall size is ca. 8.8 x 13.4 cm. The image size is ca. 8.8 x 13.4 cm. Size (in inch): The overall size is ca. 3.5 x 5.3 inch. The image size is ca. 3.5 x 5.3 inch.